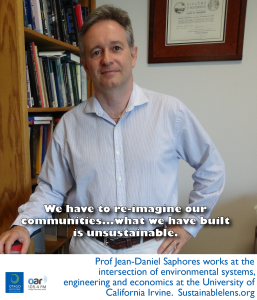 Working at the crossroads of environmental systems, civil engineering, transport economics, resource economics and sustainability, Jean-Daniel Saphores is holds multiple roles at University of California Irvine. He is: Professor, Civil & Environmental Engineering in the The Henry Samueli School of Engineering; Professor of Economics in the School of Social Sciences; and Professor of Planning, Policy and Design in The School of Social Ecology. I was always concerned with the environment, and the impact of the environment on our health…I thought we could do better at how we relate to the environment. Uncertainty, but in economics most models are deterministic – that assume we know everything, of course this has limitations, because, as you know, we don’t know everything. (can values be represented in economic models?) They can be captured to some extent. For your work to be useful, you want to try to apply models. My main interest is the the link between transportation systems and environmental systems: so environment, transportation and health. We need to have convergence – economic development in poor parts of the world, the type of economic development that avoids environmental degradation that was generated the way the US, Europe and Japan developed, then in our part of the world we need to really take into account the impacts of our decisions to consume. I believe that most people would take steps to change their lifestyle, and we also need to take a look at how we organise our lives on a daily basis in our cities and so on, change our codes so that over the next two decades we can have convergence. We can not deny reasonable affluence to other parts of the world…in any case if we carry on the current path we may be in for trouble. people’s lives without completely ruining the planet. (Activist) Not yet. I’m a member of the Union of Concerned Scientists, but I’ve only been moderately concerned so far. I’m going to become more concerned and more active. Poverty and environmental quality – together. (Motivation) Future of planet and our legacy to our children. (Challenges) Upgrade academic skills and do good.